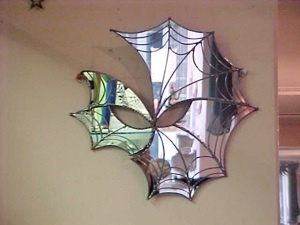 dawna combines her solder art with mirrors in several different ways. Here are a few examples of original designs. Contact her today to discuss your own personal options. 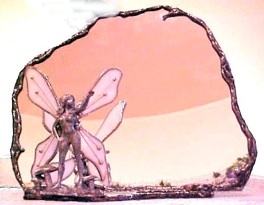 Fairy Mirror, original organic design mirror and standing fairy with pink detailed wings. Hanging Spin Mirror, with simple organic design and bead detail. The Spin Mirror is meant to free hang and ‘spin’ slowly, although they can be placed against a wall. Designed to deflect negative energies from your space with each rotation. 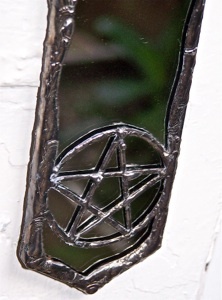 Hanging Spin Mirror, with Pentacle and crystal detail. The Spin Mirror is meant to free hang and ‘spin’ slowly, although they can be placed against a wall. Designed to deflect negative energies from your space with each rotation. 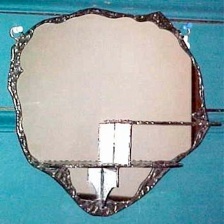 Wall Mirror with organic shape and small curio or fairy shelves. 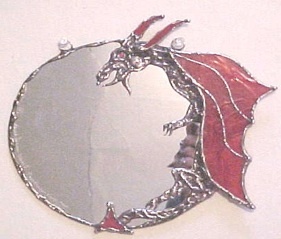 Round Wall Mirror with hand detailed solder dragon and red stained glass detail. 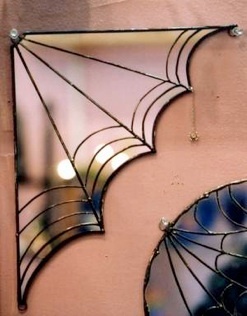 Simple Wall Mirrors with Spiderweb detail.